Occurrences of fossil marine diatom resting spore genus Liradiscus Greville are described from the middle Eocene to middle Miocene samples of Deep Sea Drilling Project Leg 38 Site 338 in the Norwegian Sea. The genus Liradiscus is characterized by a thick frustule sculptured by numerous veins. In this paper, five new taxa (L. cucurbitus, L. castaneus, L. castaneus var. reticulatus, L. caepus and L. nimbus) are described, and their stratigraphical ranges are presented. These species are short-ranging and may be potentially useful biostratigraphic markers to improve resolution of diatom biostratigraphy of the Norwegian Sea. Liradiscus castaneus var. castaneus may be evolved from var. reticulatus in the middle part of the Zone NPD 2A (18.4-20.3 Ma). The geologic ranges of L. reticulatus and L. petasus in theNorwegian Sea (L. reticulatus: earlyMiocene,L. 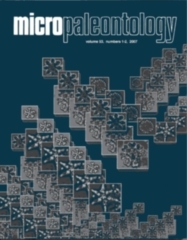 petasus : late earlyOligocene tomiddle earlyMiocene) are differentiated fromthose in the North Pacific (L. reticulatus: middle lateMiocene, L. petasus:early lateMiocene), suggesting possible the regional environmental differences.